Todd Rehm, Republican political campaign consultant and editor of GaPundit.com, will serve as moderator. Questions will come from the 10th Congressional District Republican Party Committee, though Rehm will have the option of adding some questions of his own. Though the event is open to the public, only the candidates and people approved in advance will be allowed to make audio or video recordings, according to Dennis Coxwell, chairman of the 10th Congressional District Republican Debate Planning Committee. Those who wish to record the event must agree to use the recording without editing and in its entirety, Coxwell told me in a telephone conversation on Monday. Jay Hanley, chair of the Oconee County Republican Party, told me, also on Monday, that local political activist Sarah Bell and a radio station in Greensboro had been approved for recording. Coxwell did not say how he plans to enforce the ban. Candidates will be given two minutes for opening statements and two minutes for closing statements, according to Coxwell, who is president of PineSouth, a real estate firm in Warrenton. Each candidate will have 90 seconds to respond to each of the questions asked by Rehm and then will have a chance to ask a related question of the other candidate. Coxwell said his committee has developed 15 to 20 questions that Rehm will be instructed to ask. These questions were used in the first debate in Thomson in McDuffie County, west of Augusta, on June 24, Coxwell said. The final debate will be held July 16 in Baldwin County, in the south of the District. Neither Collins nor Hice attended the candidate forum held by the Oconee County Chamber of Commerce on April 22 at the Oconee County Civic Center. Hice, a pastor and radio talk show host, lives in Walton County. 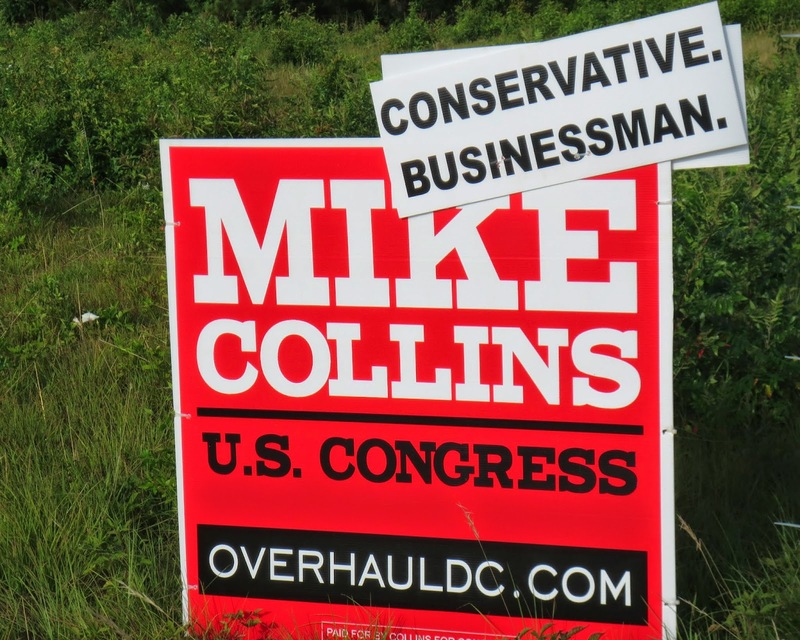 Collins owns a trucking company in Jackson in Butts County in the western tip of the 10th District. In the May 20 Republican primary, Hice got 33.5 percent of the vote in the district, while Collins got 33.0 percent. In Oconee County, Hice had 31.9 percent of the vote, and Collins had 25.2 percent. The winner of the July 22 runoff will meet Democrat I. K. 'Kenneth' Dious in November. Dious is an Athens attorney. Early voting in the July 22 runoff began on Monday, and 286 voters had cast ballots by the end of the day today, according to Carole Amos of the Oconee County Board of Elections and Registration. The county has 21,964 voters, and 5,150, or 23.4 percent, voted in the May 20 primary. Voters will be able to cast their ballots for the July 22 runoff from 8 a.m. to 5 p.m. each weekday until July 18 at the Board of Elections Office, 10 Court Street, next door to the courthouse in downtown Watkinsville. Polling places will be open from 7 a.m. to 7 p.m. on July 22. The only county race is the Republican Party contest between incumbent Commissioner Margaret Hale and former Commissioner W.E. “Bubber” Wilkes. “We don’t want outside sources coming in and recording it and then using snippets,” he said. He said that a Democrat had done just that at an earlier debate. Coxwell said Collins and Hice will be allowed to record the sessions without restrictions. I have not asked for permission to record nor agreed to any restrictions on what I use. Note: I mistakenly identified Dennis Coxwell as the chairman of the 10th District Republican Committee in an earlier version of this posting. Brian Burdette of Greensboro is chairman of that Committee. I thank Jay Hanley for the correction and apologize for the error.